People arrive at the Casa while it is still dark and cold. Winter is always cold at night and breakfast lines are extra long. People start to arrive at 6 am and circle around the sidewalks outside the Casa, shivering while waiting for the gate to open. The people need hot protein food to warm them. The Casa is a place of refuge, spiritual solace, and friendship for the many men, women, and children who come here. At night, families huddle together to try and keep warm. 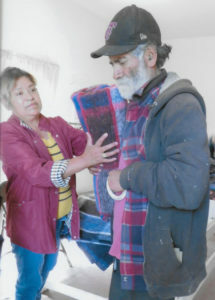 Because of your goodness, Sister was able to purchase more blankets and some extra food for an out-lying Colonia. A generous couple donated hundreds of tarps in December and January. The excitement was high as the Casa truck rolled into a far Colonia (in the dumps) to distribute new blankets, new tarps and food. 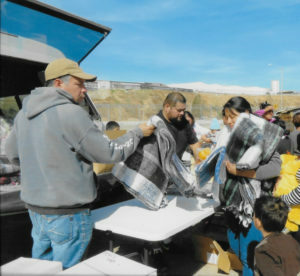 Both children and adults ran to the truck to receive their precious gifts. They felt loved, special, and remembered, thanks to you! Thank you for your continued donations in these uncertain times. We are grateful for YOU. The Casa is a real life example of the multiplication of the loaves and fishes daily. We have no overhead, other than minimal PayPal and credit card charges. MAY GOD BLESS YOU FOR YOUR GENEROSITY TO HIS POOR. This entry was posted in January 2018 by Pat Erzinger. Bookmark the permalink.